Croton plants are known for being robust, dependable shrubbery. The leaves of this plant have a variety of colors, such as orange, red, purple and yellow with spotted and streaked patterns. The green-leaf croton is native to Fiji and other islands west of Australia. 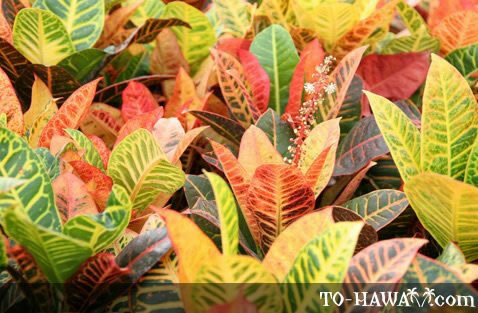 In Hawaii, the colored-leaf varieties are the most commonly seen yard plants. They can grow up to 12 feet (3.7 m) tall and are often trimmed as hedges.